An infantryman in the German army in the middle of 1939 had good reason to feel proud. The hated restrictions of the Treaty of Versailles were a distant memory and in the past few years Germany had made her military machine formidable once more. In the late 1930s Europe had seen what were known as the 'Flower Wars', when German troops marched unopposed into the demilitarised Rhineland, Austria, Czechoslovakia and part of Lithuania, but when Poland was invaded at the start of September the firing began and the armed forces were to be tested in actual combat. As the war widened the appearance of the German soldier was to change considerably, but this set concentrates on them in those early victorious months - a period when it seemed they could achieve almost anything. This is not the first set of World War II Germans we have reviewed. Actually it's about the three hundredth and something, so we'll start going down the checklist and see how it compares with those that have gone before, and we’ll begin with the poses. World War II is not about fighting in formations - its about movement, giving plenty of fire and keeping your head down - so we need lots of figures doing just that. Well, that’s what we’ve got. Plenty of the poses are squatting, crawling or just lying down - most of them in fact. Where they are advancing they are doing so with head tucked down and looking like they are in a hurry, which is great. A good many are also firing their weapons, which should please most people, giving the impression that all the figures are deep into a fire fight. The poses are more than just the usual suspects too, with some nicely thought out ones on show. Two different groups of machine gun crews are also something not seen before, and are good too, so excellent all round and a 10 for poses. Next up is accuracy. 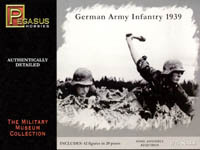 Well the German infantryman in 1939 is very well documented, and first impressions are good. The helmet is fine, and the tunic has the square-pleated pockets that mark it out as early war. Also all the men wear the tall boots that were later replaced by short boots and anklets, so full marks there. All the figures are in light order, which means they are not encumbered with packs or other impedimenta, which is fine. Each man carries his bayonet and entrenching tool, bread bag, canteen, mess tin and rolled tent section, which is all as it should be. They also have their gas mask cannisters, but with the tent section strapped around it - an unusual arrangement but not necessarily wrong. While less common we thought at least some should have the gas cape pouch on their chest, which is missing here. At the front all the appropriate ammunition pouches are present, and none of the men wear the M1939 suspenders that were to become so familiar soon enough, so that is fine for the 1939 date. As for weapons, well the rifle is the usual Kar 98k and several of the figures are carrying the MP38 submachine gun, which is correct. The prone machine gunners are firing an anti-tank rifle and a grenade rifle. The two crewed machine guns in the bottom row seem to be the MG34, which was the most widely used weapon of this type in 1939. The first is mounted on the Lafayette tripod and is being used as a medium machine gun, while the second is supported on its bipod by a wall, making it more of a squad light automatic weapon. Both are being belt fed by a second gunner (the same pose in both cases). So, no real problems with authenticity so 10 again. The next category is sculpting, the most subjective category of all. These figures are of the same standard as previous Pegasus output, which is to say excellent. All the detail is there and the proportions look very good. The box warns "some assembly required" and it is not kidding. Almost every man has a separate bayonet/tool which needs to be glued on, and many have a separate arm or, in the case of the prone figures, a separate head. Also the standing figures have separate bases (the others do not need them), so this is not ready to go straight out of the box. However in all cases the effort of this assembly is rewarded with better poses and no extraneous plastic, so at least the exercise delivers a better figure. Heads fit very well, while arms tend to be more flexible in terms of positioning, but all will need gluing. The result is a particular improvement for the prone figures, although the crawling figure (middle of row two), who has a separate helmet, has this sitting rather too high on the head. Another great effort on sculpting though and another 9. At last, you cry, the summary. There are a couple of further points to make first though. Both the standing MG34 gunners correctly have pistol holsters, but their second gunners should also have these, which they do not. Also while the assembly has been done to improve the figures Pegasus have not provided any instructions. We referred to their website at www.panzer46.com for guidance, but this is not mentioned on the box and not all their customers have internet access anyway. Finally the set is sold as 1/76 scale, slightly smaller than 1/72. In fact this is something of an approximation, with the scale varying a little between poses. This matters not for the men as soldiers come in various sizes, but the weaponry and equipment are more of a problem. However it all looked pretty consistent to us, and 1/76 is a fair gauge of the scale. Take a look at our figure comparison page (link below) to compare this set with the others. Pegasus said they would reissue this set, more or less as it is here, in true 1/72 scale in the next year or two, though many years later this has yet to happen. So gentle reader we come to the end of another review of German infantry. By sticking to a specific year Pegasus have produced a more unusual and consistent set than is often to be found, and included some features that are new to the subject. For those that know their 1939 Germans from their 1940 Germans this set, although on the small size, delivers what it promises and does so with the usual Pegasus quality.